Whatever joy the fans may get out of seeing actor Richard Dean Anderson at Oz Comic Con in Brisbane this weekend, they can also take home the added bonus that the money he is making from the event goes to a good cause. It may come as a surprise to anyone who can only recognise Mr Anderson from his time on the TV shows MacGyver and Stargate that he is also heavily involved with the Sea Shepherd Conservation Society. "The money I make here I generally put into a coffer that I have that has a couple of different funnels that go into Sea Shepherd and a couple of other charities I'm involved in," he said. "My leanings towards conservation come from my childhood. "I grew up in Minnesota on a lake and became aware of how dirty it became at certain points of the season. "There was an awareness and my father was quite conscious about saving water, so I grew up with those sorts of notions and awareness of conservation in general." Later in life, Mr Anderson met Sea Shepherd founder Captain Paul Watson. "I was listening to a presentation of his, he was reflecting on the experiences he's had at sea in trying to protect the whales - it just got me, just drew me in," Mr Anderson said. "I became a volunteer of sorts, he asked me to be on the board of directors, board of advisors - whatever I could do." Mr Anderson said it was an "absolute joy" to be a part of events like Oz Comic Con. "I become quite the people watcher when I come to these events," he said. "I like just meeting the people who are fans of the show [Stargate] or even as far back as MacGyver," he said. "It's just these particular events are just an absolute joy depending on a couple of things. "First of all the personalities of the people in general which never fail to be wonderful and very warm, and also the commitment so many put into costumes and make-up and such that they'll put on for the event themselves is just an absolute joy to watch." He said he would have his eye out for those who chose to dress as some of his characters. "There's kind of a generic look about the Stargate character I play - all you need is some khakis, some blues or greens and boots - very simple," he said. "The MacGyver I've seen a few times, and that's always kind of the funny one, because we all remember fondly the development of the mullet - you spot them a mile away." Audio of the radio broadcast of Richard's interview is available in the Video Gallery c/o 612 ABC Radio. Williams, Patrick. 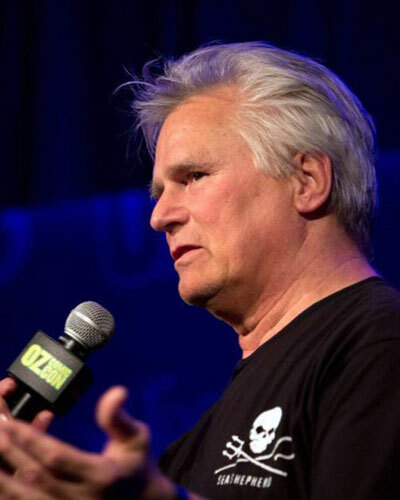 "Oz Comic Con: Convention Work Helps Actor Richard Dean Anderson, aka MacGyver, Fund Conservation Charities." ABC News. September 18, 2015.